Many years later, I would remember when I dropped out of my first 100 mile race. I have been reluctant to try really long races because of my tendency to become nauseous, but I’d had 3 good races in a row. Last year I had no problems on the Born to Run 50K, nor in the SB marathon (in spite of high heat), nor in this year’s Nine Trails race. I thought maybe it was just a hydration issue. I hoped that running in the evening and through the night would make it go away. Perhaps if I’d drunk more I’d have been OK? Who knows. I thought I was drinking enough. Something went wrong on this race, early and badly. Last year when Luis announced that B2R 100M would start at 6pm so the first bit of it ran through the night, I thought it might be a race I could do. It’s an easy course (for a 100, I mean). It comes back to the start every 10 miles, so it might be boring (but in the dark, who cares? ), but it’s easy to provide everything I need. And… if the worst came to the worst I’d be back at my car and could just leave. I looked at last year’s 50K race and tried to guess what I could do. I was fairly sure I could do a sub-8 hour 50M on that course. Wasn’t sure how to pace a 100M though, but I figured trying to start out at a 16 hour pace (9:36min/mile) and then gradually slowing as I tired seemed reasonable. It turned out that I couldn’t hold 9:36 even for the first 20 miles (and last year I’d held 8:18 for ~31). I didn’t even feel nauseous then just slow. So something else was going on. I also think I trained badly, trying to do too much about a month before the race, I got really tired and really slow on my training runs, and I don’t think I completely recovered from that either. I’m not sure that was a good idea either. On the one hand, I just felt tired during the week, but on the other sleepiness was not an issue during the run (at least the bit I did do) so maybe it did work after all. Dunno. Over the course of the last year I’ve been experimenting with various foods that I thought might reduce nausea. I brought an ice-chest (not to keep things cold, just to keep wild animals from nibbling on my food while I was doing a 10 mile loop). Monica recommended tailwind. Melons and oranges have worked in the past. On Coyote Backbone, a quesadilla was the last thing I could eat. Blocks seemed to work better than gels for me. Cliff bars better than either, up to a point. So I brought 6 pre-peeled oranges, one cut-up honeydew. 12 quesadillas (one per lap plus two spares), more than enough cliff bars and blocks to see me through the race if I were only to subsist on me. Some gels (just in case). A bag of home made cookies. salt tablets. 2 gallons of water and a mug. It seemed like an enormous amount of food, but I hoped that if I had enough choice something would work. And now I have to deal with all the uneaten food somehow. I also brought four long-sleeved technical shirts (to put on as the evening got progressively cooler. Gloves (which I seem to have left somewhere on the course. Drat it). Two different caps, just in case. A wind breaker. A spare pair of shoes… Three bike lights (each is supposed to last 6 hours before needing a recharge). Oh, and I brought a scale too, so I could see if I were losing too much water. I checked it before I started, but never again. Which was silly. I resolved to visit the port-a-potties at the end of each lap. I did this, but it didn’t help. It wasn’t until about 5 minutes after I gave up that I had any desire to use one. By then it was far too late. Maybe I should stash an enema next time? The weather looked perfect. It had actually rained the day before (more in SB than Los Olivos though) and this brought the temperatures down, though it did not make the ground any softer. The rain had gone, leaving blustery weather with intermittent cloud cover. Ken Hughes offered to pace me. I don’t see the point of pacers in an ultra. If I can’t motivate myself, no one is going to change my mind, I’ll just get angry with them. Besides I kind of like running alone. We lined up. I didn’t pay too much attention to this, there were only 35 of us, but when the gun went off I found the person ahead of me was just walking, a novel concept, but understandable in a 100m race. So I had to dodge to get around her. I seemed to be in second place. The guy Luis said would win the race was ahead, but no one else was near. Then Kevin caught up. And we ran together for a bit. Kevin complained that we were going too fast, 7:30s. I felt, well, why not? we’ve got a nice easy bit of road here for about half a mile, a 7:30 pace for half a mile isn’t going to be a problem, we’ll slow when we get to the hill. Kevin said he planned to walk up the hill (but he didn’t when we eventually got to it). I wondered where Brian Toro was. He’s faster than both Kevin or I. Kevin said he was being smart and not going out too fast — unlike us. Then someone else joined us (Ben Holmes, I later learned). This was my little clump for the next 15 miles. We kept parting and rejoining. I slowed when we got to the hill, but the others didn’t and soon I was alone. Oh, the others weren’t far ahead, I could see them most of the time. After a bit we came to a closed gate. The others were far enough ahead that I didn’t notice how they navigated it. There was a road off to the right. I couldn’t remember a closed gate. I worrited for a bit, until I realized the gate was decorated with flagging tape. We were supposed to go through it. Still, it meant stopping, opening the gate, stepping through, closing, restarting. I don’t like wasting seconds in a race. On the other side of the gate were horses. I guess that’s why the gate was closed this year. It turned out the dog was a bandit and didn’t have a bib. 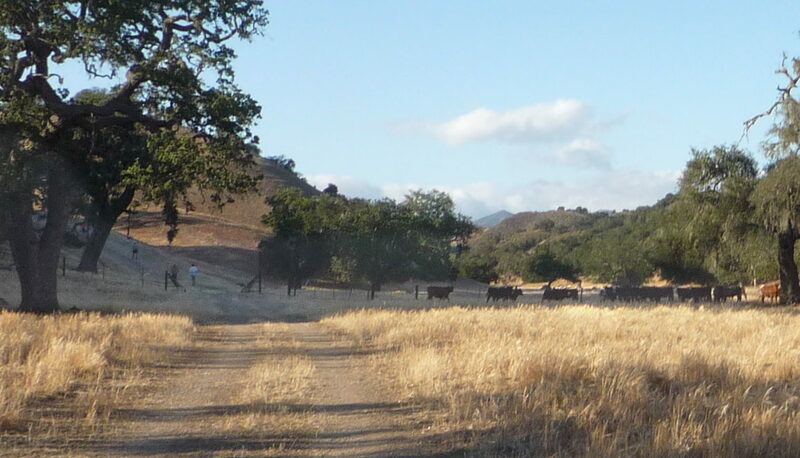 At one point the group in front of me started a (small) cattle stampede with the cows running down the hill on the left to hide under the tree on the right. This was over when I reached them. Then the course twists me back to the entrance road and the registration tent. Luis is there and asks me if the course is well enough marked, he’s been told it’s a bit sketchy. Seemed fine to me though. Of course I know lap 1 pretty well. 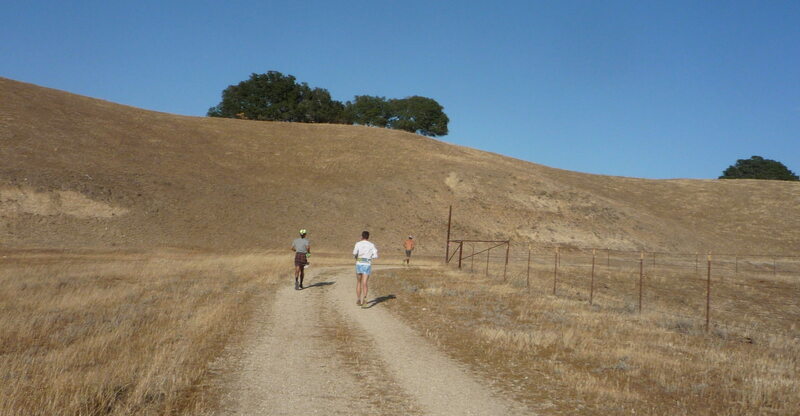 I’m running along the edge of the ranch, next to Figuroa Mtn Rd., then inward again to the second aid station. I don’t need anything so I run through it, and catch up with Kevin, Brian and Ben who are just leaving it. Kevin and I run together for a bit, and then Ben joins us. Normally there are wildflowers on this race, but this year the only blooms I’ve seen are from purple sage. The drought has hit pretty hard. Up a last hill, and the long downhill stretch to the start line again. At the start area, first Kevin, then Ben, Brian and finally I, peel off to our various cars and aid stations, but we regroup fairly quickly and start on lap 2. I do have an ulterior motive for going fast. I want to do as much of lap 2 in the light as I can. Lap 2 is trickier, and I know it less well (the 50K does lap 1 twice and lap 2 once). 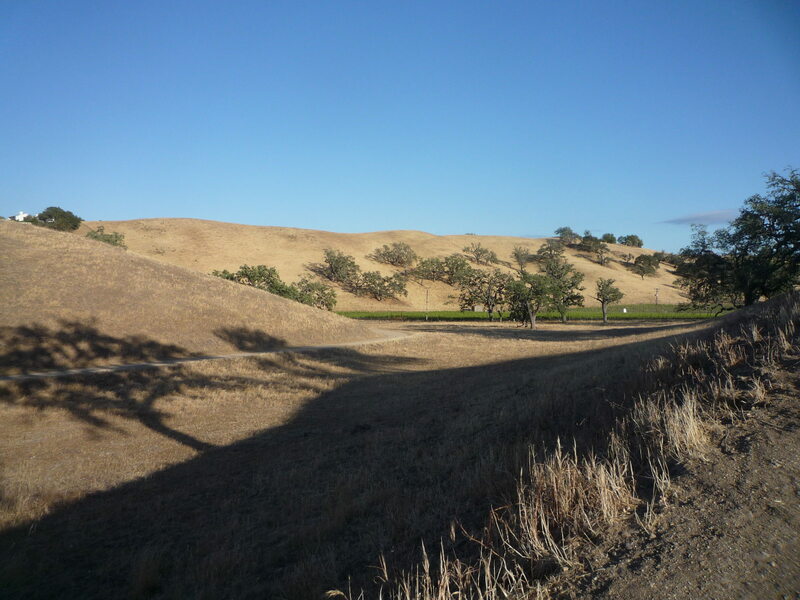 Up a hill and down to the second aid-station, and then out along a dry creek bed. There’s some mulefat blooming here, at least something is even though mulefat isn’t very impressive. Then up another hill. And here I slow and lose Kevin, never to catch up to him again. At the top of the hill we meet with Lap 1 briefly, and suddenly, behind me I hear footsteps catching up. There’s a 200miler zooming down the hill. He’s gone ~140 miles and I’ve gone ~14. And he’s running faster than I. Impressive. Then off the main road and on a smaller route, which eventually dwindles down into single track. There’s a peculiar thing hanging from a tree off to my right and I’m trying to figure out if it is a course marking or not when someone catches me up. It’s Ben. I have no idea how he got behind me, but now he’s ahead of me again. I realize later that the “peculiar thing” was a glow stick attached to a wind chime (why the wind chime you ask? I have no idea). At the moment there is too much light for the glow stick to glow, so it just looked odd. It is a trail marking, but not a turn indication as I had feared. The light is going now, but that’s OK, the rest of lap 2 isn’t tricky. I turn on my flashlight as I plunge down the precipitous drop at the end of the ridge trail and head to the first aid-station where I ask them to fill my camelback. But the water just trickles out of their container and it seems to take forever, so I just get them to fill it enough to take me back to the main station. Up dead cow hill. Hard to recognize anything in the dark. The glow sticks are glowing now. The second lap took 1:48 hours. Well so much for any hope of an 8 hour 50M. The second lap is longer and trickier than the first, but not that much. I didn’t intend to slow that much, but I don’t feel I can go any faster. Things are not going well. Also, and more worrying: I wasn’t able to finish the cliff bar I started. So this time I’m taking blocks. Anyway, out on the first lap again. It’s dark. I see the occasional light ahead. My own light is so bright that only the brightest stars are visible. The moon is nearly new and isn’t up yet. The people at the first aid station are looking bored and seem disappointed when I just run by. 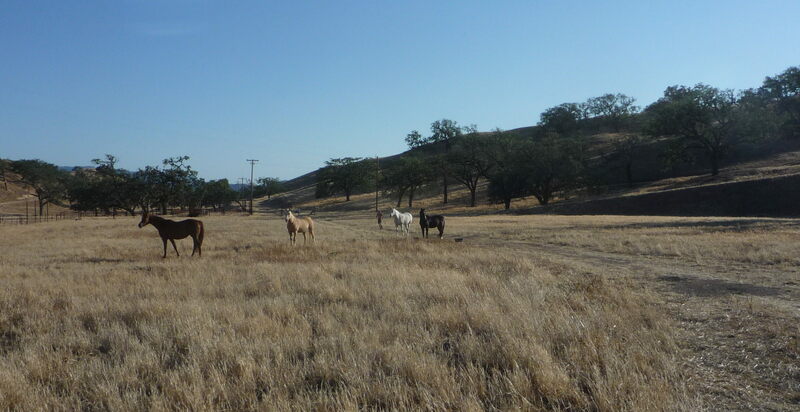 The horses mill about when I run through them. The cattle are invisible. When I’m at the bottom of the ~4 mile hill I hear a whoop! from above. It sounds like a Kevin whoop, and I whoop back. At about mile 25 I pass Jon Zaid. He’s already done 125 miles of his 200. So we both have 75 miles to go, but he’s 5/8ths done when I’m only a quarter. And he’ll probably finish. Somewhere around the second aid station I am once again passed by Ben Holmes. How does he keep getting behind me? And he zooms off into the distance again. Every now I greet people on the course. I’m not sure what to say. I said “Good morning.” once by mistake. “Good night” isn’t really a greeting. It isn’t evening any more. Third lap: 1:41. Considerably slower than the first. I couldn’t finish the quesidilla I started the lap with, and didn’t even try the cliff blocks. I start out on the fourth lap. Near the second aid station I am again passed by Ben Holmes who says “I guess I’ll be seeing a lot of you this evening.” I hope so, but I’m starting to doubt it. He disappears ahead. Haven’t seen Kevin or Brian in ages. Someone passes me. I guess I’ve slowed a lot. The odd thing is how few people have passed me so far (except for Ben Holmes whom I’m no longer counting). I still don’t see a mariposa lily. I try a cup of soup. This brings an immediate sense of nausea, but it fades and I feel I have more energy as I plow up dead cow hill, actually running (sometimes it is easier to run up a hill when you can’t see how steep it is). Maybe I can do 50M if I subsist on soup? Soup is not something I’ve experimented with on my training runs, too hard to carry. I have another cup of soup at the aid station at the start. As I’m eating it two guys come in, they are cheerful and in much better shape than I. I head out before them, but with the nagging feeling that they’ll catch me soon. I come to the aid station and get another cup of soup. I tell them they won’t see me again, that I’m giving up after this lap. Then a wave of dizziness hits me, and I decide I’m not going any further. The quickest way back to the start is they way I have come. So I trudge back that way. One of the guys at the station sees me going the wrong way and tries to tell me where I should go. I know where I should go. But I can’t. I’m going back. I don’t even try to run. It’s pretty cold. My hands are cold. I realize I’ve left my gloves somewhere. At the aid station? Did I take them off to hold the soup? A port-a-potty? I don’t know and they are gone and my hands are cold. The walk back seems to take forever. I pass several groups. How odd. Other people run in clumps, I don’t. No one seems to notice I’m going the wrong way. I’m not sure how to DNF. I need to tell someone. But whom? Everyone seemed to be asleep, except for the person running the aid station, and I’m pretty sure she’s not the right person to tell. I decide to pin my bib to the timing tent. But when I (finally) get there I find there is actually someone inside who is sort of awake. She tries to convince me not to give up. Grrrr. If there were any way I could go on I would, but everything has fallen apart. I load up my car (sans gloves) and drive back to SB. I made the mistake of answering the telephone the other day. It was my sister and I hadn’t spoken to her in ages. I told her that I was planning to run my first 100 mile race soon. Then she told my mother. My mother doesn’t like me to run long distances. It worries her. I don’t understand her worry, and she doesn’t understand why I’d want to run. So I prefer to present her with faits accompli rather than let her worry about what might happen. But I didn’t tell my sister not to talk to my mother… so when I next called my parents my mother let me know she was unhappy. Perhaps I should have mentioned that to my mother, it might have made a difference, instead I just changed the subject when I could. The first chunk of the race will be in the dark and cool. I view the cool part as an advantage. My mother might view the dark part as a disadvantage. So I didn’t mention that either. I don’t know what I’m doing. Last year I did a 50K race on the same loops in 4:12:18 which was an 8:15 pace for 30 miles. How much slower should I go? I don’t know. I’m thinking to try averaging a 9~10 minute place (starting out at 9 and slowing as the race continues). But one never does the first time one tries to do something.